Small Animal Talk: Book review: The Trainable Cat. Plus that Downward Dog video and dogs day out. Book review: The Trainable Cat. Plus that Downward Dog video and dogs day out. Hero and I will be trying out the key skills in this book. “[Vet] visits are essential for keeping your cat in tip-top health, but your cat cannot know this, and you cannot afford to simply take the attitude that what happens at the vet’s stays at the vet’s. You may be able to forget the struggle your cat put up while being examined, your vet may be able to dismiss it as one of the expected hazards of the job, but your cat will not forget so easily.” (Bradshaw and Ellis, 2016:225). Some wise words from my new favourite book. One of the most offensive things I do on a daily basis, in fact multiple times per day – at least from the point of view of my feline patients – is to remove them from the cat carrier to examine them. Some cats will walk out voluntarily, and proceedings are ALWAYS better. They have a sense of control. But those that don’t resort to all sorts of behaviours which make this a struggle – adopting the “starfish” position. Digging in. Curling up and becoming heavier than titanium. 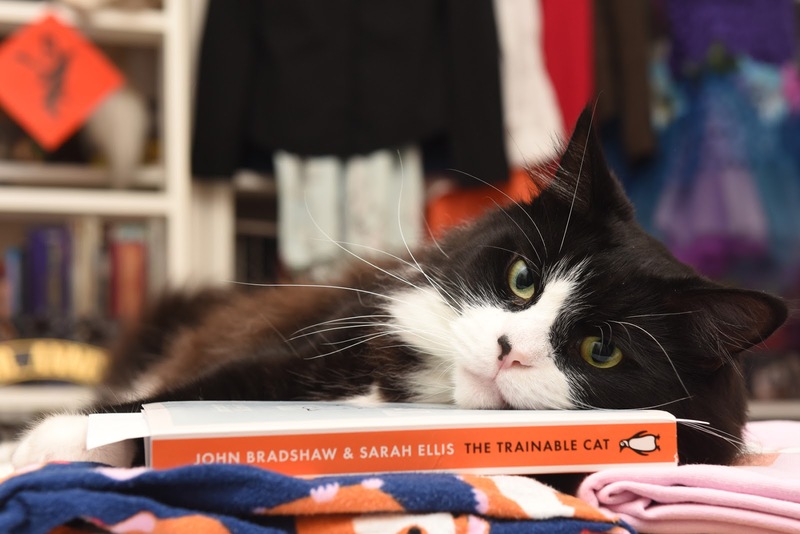 If you lived with a cat, plan on living with a cat, know someone who lives with a cat, or don’t live with a cat but you’re interested in animal cognition and learning, you will love The Trainable Cat: How To MakeLife Happier for You and Your Cat by John Bradshaw and Sarah Ellis. Hero has the crazy ears in this photo because he was about to chew on the book. This book is not a book about training your cat to do stunts or tricks. Rather it recognises that we expect cats to adapt to our world, even when it goes against their natures. They do a pretty good job, but sometimes it overwhelms them. It may shock readers to learn that, “lacking the necessary brain structures, cats must logically perceive their relationships with their owners (and with each other) in a far simpler way that we conceive of our relationships with them” (p14). That does not mean they’re not intelligent – it means we have to learn how cats learn. (And yes, it’s also unlikely that cats can be devious, spiteful or scheming – a myth that unfortunately is associated with very unhelpful punishment of cats – the authors explain why this inevitably fails to change their behaviour). The book opens with a discussion of feline evolution and ethology. How do they live in the wild and what are their natural behaviours? 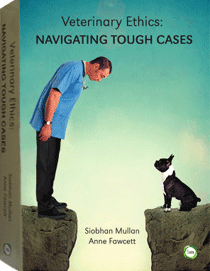 It provides a core set of key stills, all outlined in one chapter, that can be used to help cats cope with a range of challenging yet common situations (outlined in the other chapters): adapting to an indoor lifestyle, dealing with being touched, going to the vet. And the carrier. As far as I am concerned these authors have nailed it: there is an entire chapter on how to get your cat in (and out) of the cat carrier. There is even a beautiful flow chart. 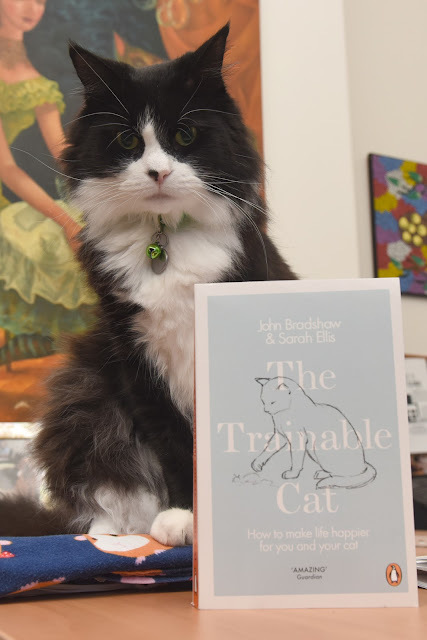 If every cat owner read this book and applied these principles, the welfare of their cats would be excellent – and the bond between cats and owners would be stronger – to the benefit of both parties. This weekend, I'm making Hero a toolbox, and investing in a more suitable carrier. Meantime, on an anthropomorphic note, check out this video, “Downward Dog”. As one of my colleagues said, they weren’t 100 per cent sure about it – but it says a lot about human behaviour. Its 11 minutes so you’ll need a cup of tea. We’d love to hear your thoughts. Finally, if you’re in Sydney this weekend with a canine friend or two, the Pawfect Day Out will be held at the Vic on the Park on Sunday from 2-5pm. More info here.